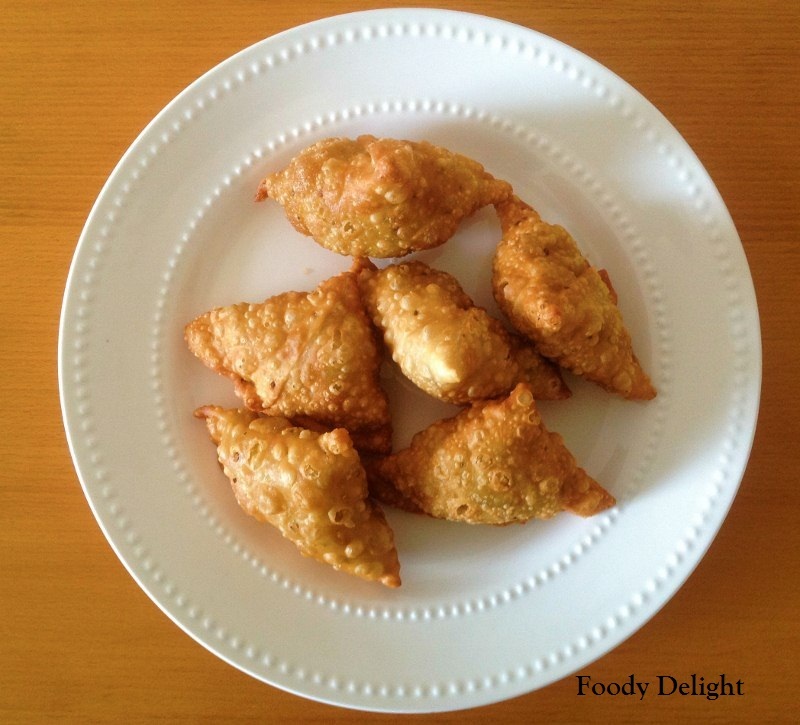 Samosa are the most delightful and tasty snacks of India. Samosa are available everywhere and yet the samosa varies wherever it is found. That’s the beauty – you can make Samosas with the many type of fillings. Samosa are always appetizing. Served with tea, they form the basis of the perfect snack. In a large bowl, combine the flours,carom seeds,salt and oil and mix well. Prepare a soft dough by adding little by little water at a time and knead the dough for 5 to 6 minutes. Cover the dough using the plastic wrap or moist kitchen towel. Let it rest for half an hour. Boil the potato into the pressure coooker. Place a pan on medium flame and add oil into it. When oil heats up, add cumin seeds and fry for 30 seconds. Then add green chily paste, ginger paste and garlic paste.Fry till the raw smell from the paste goes off. Add red chilly powder, coriander powder, tumeric powder and garam masala. Fry for 30 seconds. Add boiled potatoes, green peas and salt. Mix well and cook for 5 minutes. Sprinkle chat masala , mint powder and crushed kasuri meethi. Stir well and cook again for 5 minutes. Finally add chopped cilantro and lemon juice.Mix well and turn off the flame. Spread the filling mixture into big plate and allow it to cool. Divide the dough into 9 large lemon sized balls. Roll out each balls into 1/8 inch in thickness of circle. Do not roll the dough too thin. Using pizza cutter, cut the circle into two equal portion. Keep all the sheets covered with moist towel. Meanwhile prepare the glue by mixing 1 tbsp of all purpose flour and 2 tbs of water. Take one sheet, facing the circular portion towards you. Apply the glue on all the edges and prepare the cone by closing side of the non circular portion. Now fill the filling into the cone and seal them properly. Repeat the same with the remaining sheets. 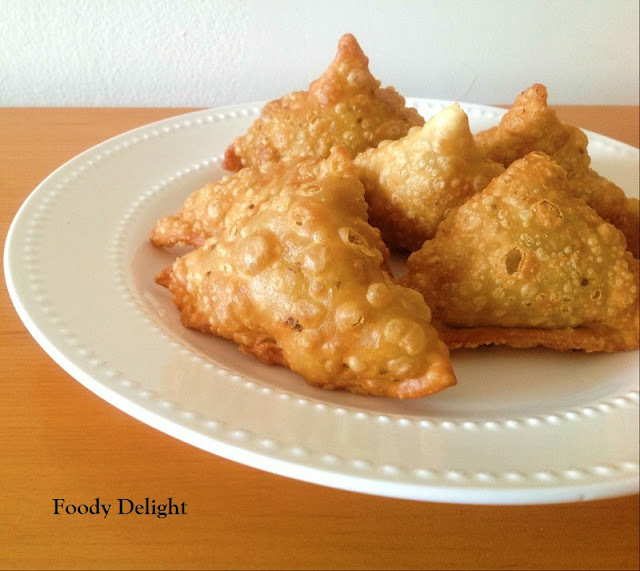 Heat the oil into deep bottomed pan and deep fry all the samosa till they are light golden in colour. Always fry the samosa on the medium flame. 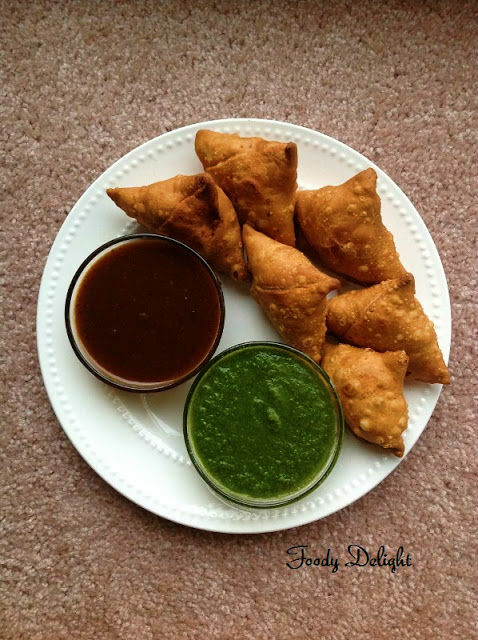 Serve the Samosa with green and tamarind chutney. Add all the ingredients into the blender and blend it to the smooth paste. Green chutney can be store in the refrigerator for 3 to 4 days. Soak the dates into hot water for 15 minute and grind them to the smooth paste. Add dates puree and all the other ingredients into one pot and cook on medium flame until the mixture starts boiling. Once the mixture starts to boil, turn the flame to low and simmer the mixture for 10 minutes. Check for the salt. When done, turn off the flame . Allow the chutney to cool down to the room temperature before storing into refrigerator. Tamarind chutney can be stored into refrigerator for 1 month. 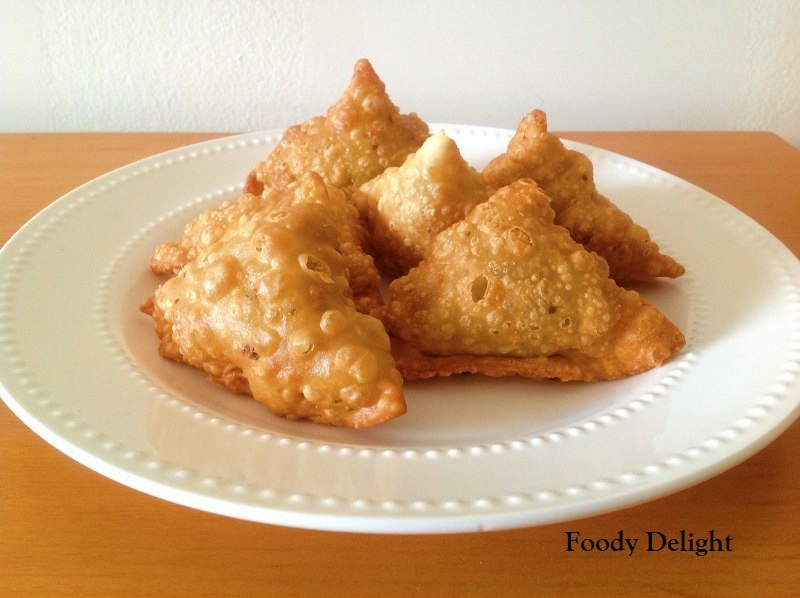 Omg, super crispy and addictive samosas, makes me drool. Crispy and yummy snack,my favorite. Was wondering what the green sauce taste like... is it spicy?